Design of architectured materials and structures, whether in nature or in engineering, often relies on forms of optimization. In nature, controlling architecture or spatial heterogeneity is usually adaptive and incremental. 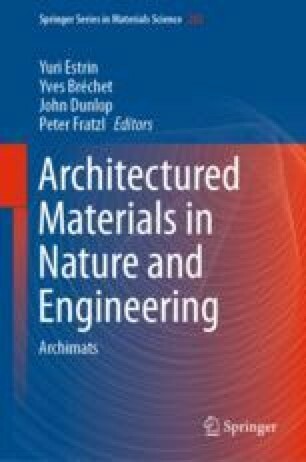 Naturally occuring architectured materials exploit heterogeneity with typically graded interfaces, smoothly transitioning across properties and scales in the pursuit of performance and longevity. This chapter explores an engineering tool, topology optimization, that is at the frontier of designing architectured materials and structures. Topology optimization offers a mathematical framework to determine the most efficient material layout for prescribed constraints and loading conditions. In engineering, topology optimization is identifying designs with interfaces, materials, manufacturing methods, and functionalities unavailable to the natural world. The particular focus is on the variety of roles that interfaces may play in advancing architectured materials and structures with topology optimization. This material is, in part, based upon work supported by the National Science Foundation under Grant No. 1538125.